The year is 1969: Man has just walked on the moon, progressive values have led to a cultural revolution and a new age of consumerism is changing every British household. But in the sleepy Suffolk village of Lindsay Carfax, time stands still. Aristocratic detective Albert Campion arrives on the scene to discreetly investigate the Carders, a shadowy group of nine local bigwigs who are rumoured to run the entire village between them and have a demeanour that would make the Masons seem welcoming. It’s not long before Campion begins to unearth some disturbing secrets hidden beneath the bucolic veneer of Lindsay Carfax. People in the village have been disappearing and then reappearing after nine days, a number that reappears with cryptic regularity. Were the Carders involved in the fatal overdose of two archaeology students, and, if so, how long before they devise a similar end for Campion? If he had ever given the subject much thought, which he had not, Mr Campion’s ideal archaeologist would have been a tall, muscular, sun-bronzed figure; a man of military bearing, with a pencil dark moustache and gleaming teeth, dressed in jodphurs, riding boots and pith helmet. He would be fluent in at least a dozen languages – ancient and modern – of the Middle East, and be accompanied everywhere by a fiercely loyal Sikh manservant with a ruby in his turban and several curved daggers concealed about his person. He would be the sort of man who was fatherly to his army of native diggers and who would not give a fig for a Pharoah’s curse. Dr Mortimer Casson, however, was short, skinny to the point of emaciation and had buck teeth which made him lisp when he spoke. His hair was unkempt, unwashed and unruly and Campion thought he still detected boyish curls which had survived what were clearly Dr Casson’s attempts at self-barbering. At least, Mr Campion hoped the haircut had been self-inflicted; if it had been paid for, it had been a fee extorted under false pretences. The story is never too reliant on humour however. I was quietly moved by the portrayal of Campion who, in this story, is pushing seventy and knows he is more suited to the last days of the Victorian era in which he was born rather than the rapidly changing society of Post-War Britain. All of the old favourites are here and struggling to cope with modern society: Campion’s wonderfully caustic wife Lady Amanda, not to mention Magersfontein Lugg, a gruff ex-burglar and now Campion’s loyal servant. This makes the premise of the novel fiendishly clever. Campion walks into a village straight out of the Golden Age of Detective Fiction but this is a world in which the old rules of the genre don’t apply. A splendidly Ruritanian sub-plot involves Campion’s son and daughter-in-law visiting Monte Carlo to investigate the aging doyenne of the Carder’s spending an unaccounted for fortune in the world famous casinos. 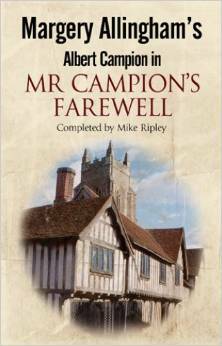 Mr Campion’s Farewell is a crime fiction event which should appeal to new readers and long term Campion devotees. Severn House have commissioned another Campion adventure from Ripley titled Mr Campion’s Fox.